As recommended in the Washington Post, the Lonely Planet, and "Kazi" (Japanese yacht magazine). 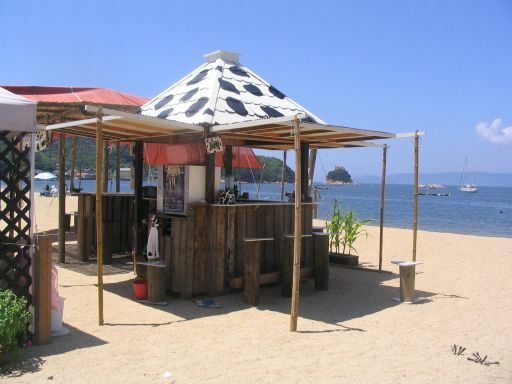 Welcome to Shiraishi Island in the Seto Inland Sea (Okayama Prefecture--Western Japan). Spend a few days discovering the island: Participate in a local festival, go kayaking, enjoy hiking and pilgrimaging. 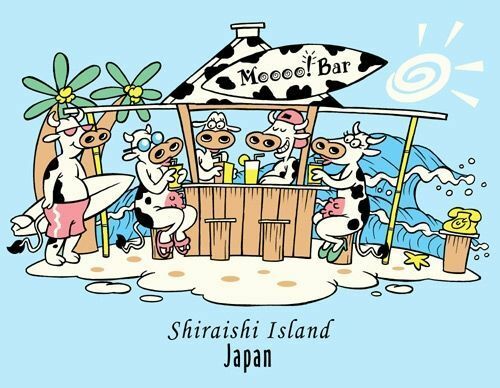 Or just kick back and relax on the beach in a sunlounge at the Moooo! Bar. Please see our "Accommodations" page to book overnight reservations. The original Moooo!Bar. We've morphed since then. April is a great time to be on the island. It's springtime, so the weather is great for outdoor activities such as kayaking, trail running or hiking. You'll have the whole island to yourself! April 29 is the start of the Golden Week holidays in Japan (one week of holidays! ), a great time to schmooze with the locals and eat, drink & be merry! Escape the holidaying hoards in the city and spend a crowd-free Golden Week on the island! The Moooo! Bar will be open for Golden Week, so come join the herd! This is still the low season on the island, and with the exception of the international villa, rooms are plentiful. Many choose to enjoy the warm weather by camping on the beach (free)! May and June are great times to go pilgrimaging before the hot weather hits. The pilgrimage trail be cleared for spring hiking from the third Sunday in April. Grab a map and walk the 400-year-old route that follows the perimeter of the island and experience fantastic views of the Seto Inland Sea while visiting some of the 88 sacred sites along the way. For more information, see our Shiraishi Island blog posts, starting with Introducing the Shiraishi Island Pilgrimage. See the Shiraishi Island Pilgrimage Facebook Page. "Mushi Okuri" Festival (throwing bad insects off the island) Although this is a Shinto ritual, the ceremony and parade starts from the Buddhist Temple. At 10 am locals will start the walk around the streets hoisting a boat and calling out to all the "bad insects" to get into the boat, after which they release the insects and the boat into the Inland Sea. Come join the procession and learn how to call out to the insects (with a special song, of course!). The annual Shiraishi Yacht Race takes place on this day too, so if you like boats, check out the 50 or so sailboats in the "new port" in the morning! We'll move from being open only on weekends to being open every day starting July 14. Come lounge on the sunlounges by the sea or just sip on a cool moogarita at the bar. The Moooo! Bar gets a little better every year, so stop by and find out what's new! Mukaebi Welcoming the spirits to the island. Takes place at Bussharito Buddhist Temple. Okuribi Seeing off the spirits. Lanterns are lit and set out to sea in a beautiful ceremony called Toronagashi. Starts at 7:00 pm. Shiraishi Dance follows at 8:00 pm and is performed on the beach. This signifies the end of Obon. Aug. 26 (Sunday) Live Band and Fireworks Night on the Beach! (charter ferry available for day-trippers).